It feels normal again to have a dog in the house. To add one more thing to do to our list of getting everyone out of the house. 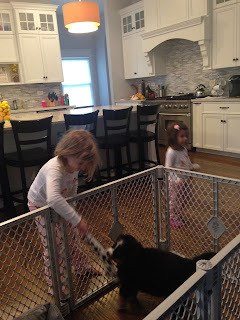 Feed the dog, take out the dog, make sure we tire her out and play with her. It's all become part of our routine again. It wasn't hard to do but it requires more time and certainly more time than an almost 11 year old dog did. Time for training, time where you can't be gone longer than three hours at a time and time for playing. It's almost like having two toddlers in the house. Hailey needs help sometimes down the stairs and so does Sadie so often I carry both of them to the car or outside - side by side - just like having twins! More than once both of them had to go to the bathroom at the same time. If I'm lucky enough that Austen (or even Peyton) is home with me then I can ask one of them to help me otherwise one of them has to hold it while the other goes. Just like Adler, I take Sadie everywhere I can with us. It may just be to drive car pool or pick up the kids from school but it's getting her used to traveling in the car and so far she's proven to be a good little rider. Last week I took her to the vet for her 12 week check up. She weighed in at 23 lbs (she's probably about 25-26 lbs as I write this). She's getting big and bets are that she probably will be bigger than Adler. She's different from Adler in a lot of ways like the fact that so far she doesn't mind being doused with water (I had to give her her first bath with Austen and Peyton's help because she threw up in her crate - that was a fun day! ); she is very vocal and knows how to bark when she wants something like her food or for you to get up in the morning; and she does get the supposedly trademark sweaty paws. Sadie is also similar to Adler in that she loves to sleep on her back and get her belly rubbed. She loves to be close and already knows "her people" and her house. 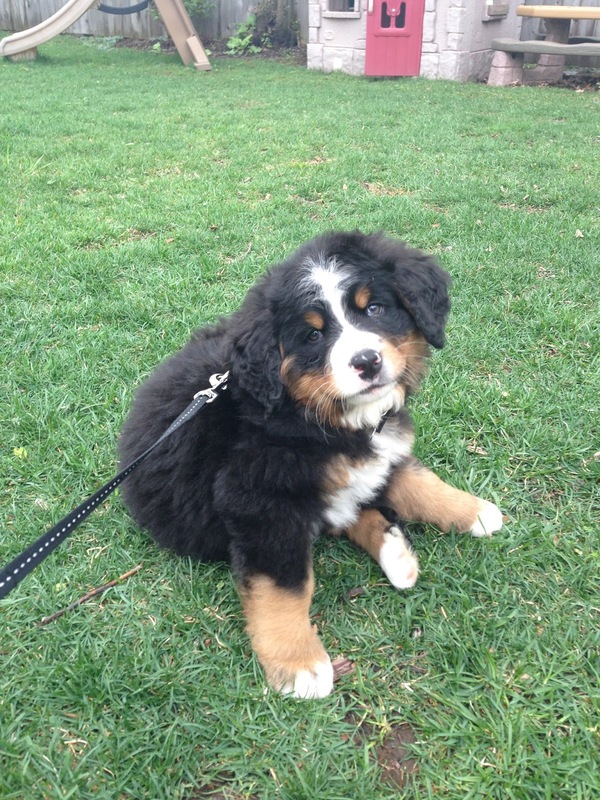 It's nice having the same breed, but a Berner with a bit of a different personality. We will always love Adler but now we get to experience even more of the different sides of a Berner. And that makes us love this breed even more. Austen with Adler last summer by the baseball fields/tree. 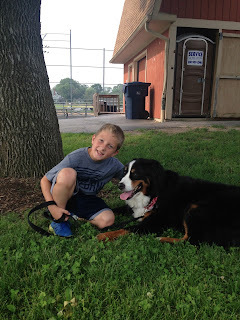 Austen with Sadie this spring/summer by the same baseball fields/tree. I was getting all of the kids and their gear out of the car after school and in my peripheral vision I noticed Peyton had jumped on an old bike of Austen's - one without training wheels. It took my brain a second to comprehend that she was riding around the driveway on it all by herself. What was amazing was that we hadn't even really practiced with her. I mean we had filled that old bike with air in the tires and gave her a few pointers here and there but really taking the time to teach her - we didn't. I guess she grew tired of waiting and figured it would be quicker to learn how on her own. I guess this means we owe her a new bike! When I decided to stop working a little over 1.5 years ago, it wasn't because my youngest had turned 1 and needed me at home. It was because of my oldest. He was starting to get more involved with after school activities, needed more help with a growing pile of homework and I was beginning to resent having to miss his games for work meetings. Well, this is what I signed up for. I quit my job so I could drive car pool; become more involved in school volunteering my time and lending my knowledge; making sure all homework got done in between games and practices every night; and keeping up with the piles upon piles of laundry that just seemed to multiply while trying to schedule any work or errand needing to get done in a few spare hours of free time that mostly happened at night. I see more and more divide and conquer going on in our household because surely the girls don't want to sit through more than one game a day no matter what sport it is, and we need to be home for Sadie too. So we switch off most days/weekends. 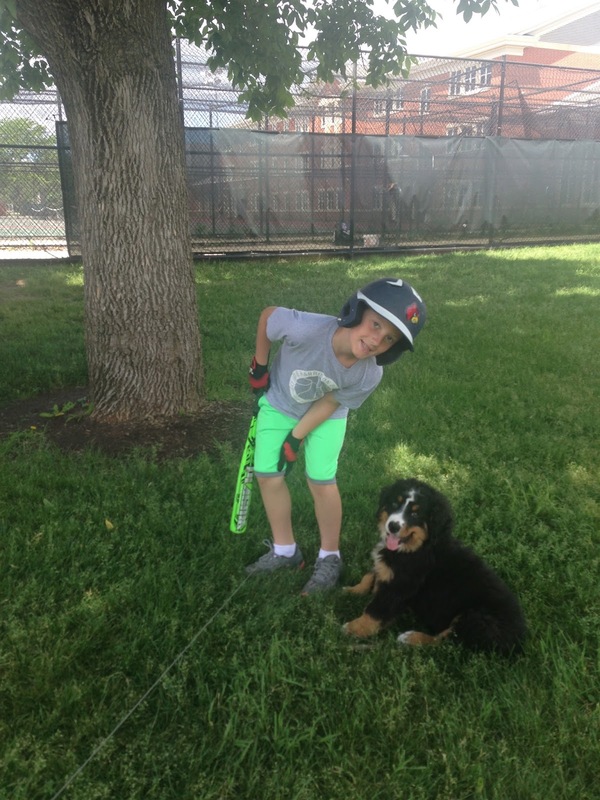 I usually take the soccer games and a few baseball while Tom sits through most of the never ending travel and little league baseball games (is it too late to switch him to lacrosse?!). Just this past weekend, Austen and his travel baseball team had the opportunity to play at Miller Park in Milwaukee at the little league stadium. What a great opportunity for him and his teammates. I had opportunities like these growing up. My parents made sure I had them. So now I'm paying that forward for my kids. Are they lucky? Yes. But I see parents just like me every day running their kids to a baseball game only to rush them to their soccer game right afterwards. Is it too much? For them - probably not. Austen for one thrives on being busy. For me - maybe. But this is what I signed up for. And, I'm grateful that I did. I know I will blink and he'll be graduating from high school. 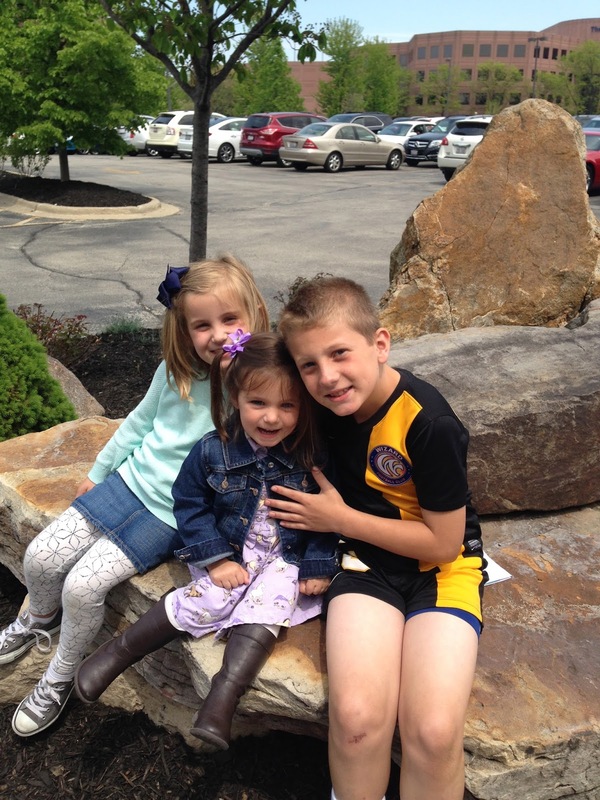 I can always work again, but I can't ever have these years back of being there for my kids in this way. I know I am exactly where I should be. After all, this is what I signed up for. Every year, each grade at our school puts on some big performance about something. In first grade, Austen and his classmates learned about Washington, DC, and built monuments for their big project. In second grade, they did a whole unit on their family's heritage. So now for third grade they are each researching a hero of our very own heartland - the USA. 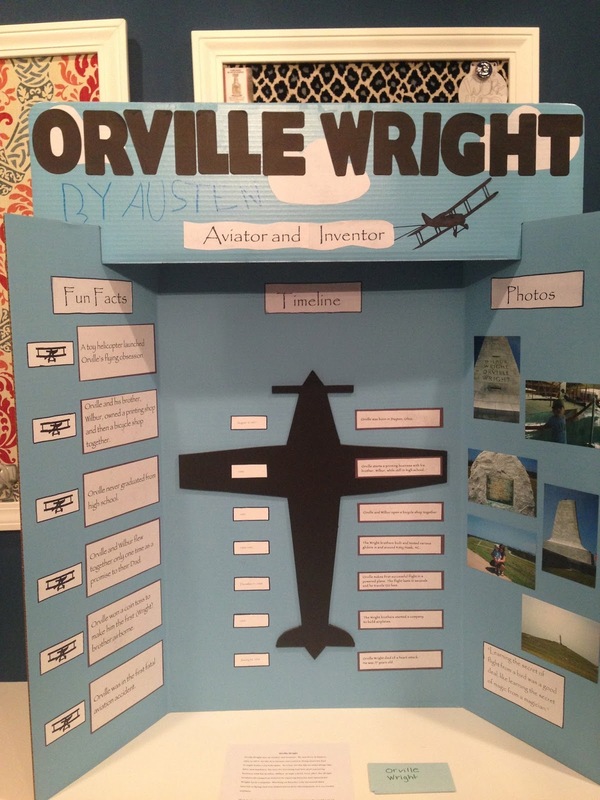 Austen was given Orville Wright. 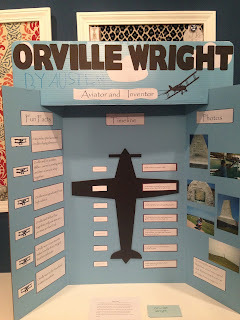 How great is it that when he was 2 1/2 we went to the Outerbanks on vacation and visited the site where Orville had made his first official flight? So we had pictures of Austen at this age around the museum-like visiting area that they have constructed there. Perfect for his presentation! We got to work. Austen read books, then I had to read the books to make sure he accumulated the correct facts and information for his timeline. Then we needed to layout how his presentation would look. We traveled to the local craft store to buy his poster board complete with a header. Then it was decided that we would sketch out on paper how his presentation would look. I ordered the pictures from the Outerbanks that we needed while Tom got creative with the timeline and helped Austen build a model of one of Orville's glider planes. The board looked great...until last night as we were trying to get all the kids into bed, he kept asking me if he should write his name on his poster board. I said I don't know, maybe on the back as I was distracted putting the other two to bed. Later when I walked into his room, I saw right away that in fact he had not waited for me and with a big blue marker, on the header of his presentation board he had written in big blue letters - By Austen. Right Smack in the middle of our title. I could've killed him. Well, at least it makes his presentation look authentic Tom and I said through clenched teeth. Oh well. It's his project, we reminded ourselves. 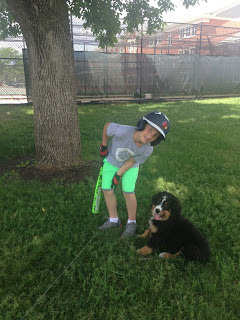 And, even though it was Mother's Day today we spent a bit of time going over Austen's presentation with him as well as watching his morning soccer game and having him take a few swings at the batting cages. Maybe we should have relabeled today, Austen's Day?! We did, however, squeeze in a fabulous brunch with my three kiddos, and our new puppy Sadie spent a lot of time with us today too. Welcome to the family Sadie and I'm glad I'm your mom too! "Addie Died, Now We Have Sadie"
Week one with Sadie went surprisingly well. 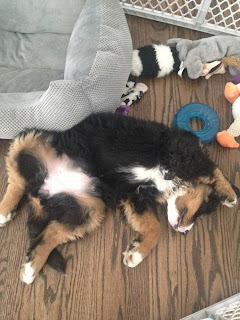 Maybe we did a good job of picking out the best puppy or maybe all Bernese Mountain Dogs are just good dogs because I remember Adler being pretty easy too. Probably a little bit of both. The kids have quickly adjusted to having a dog in the house again. At the beginning of the week, Hailey was alternating between calling Sadie, "Addie," so I once again explained to her that Adler was no longer with us anymore, that she died, but now we have Sadie. Well, who knew that she would understand that statement so completely and all the right emotions that went along with it. I wasn't really expecting that she would get it. But now she says it to me a couple of times a day. "Addie died" (with a sad face), "but now we have Sadie" (with a happy face). Hailey clearly delights in having a dog in the house again especially a puppy. She isn't even afraid anymore if it chases her and nips her a bit. Peyton on the other hand is still a little stand offish (part of her "I'm afraid of everything" stage), and Austen is great with Sadie - playing with her, petting her as well as telling her no and ignoring her when she jumps. 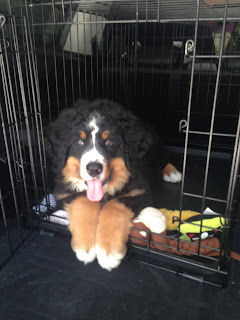 Sadie has also had two training sessions which have gone pretty well. Her trainer advised us to keep her in a pen or crate to train her initially which makes my life easier since I don't have to follow around two toddlers now. 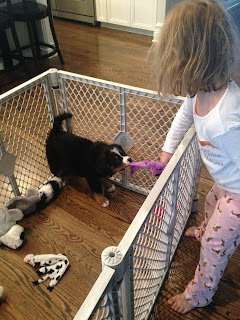 But the pen has helped the kids become more comfortable with her too since Sadie can't chase them and nip at them anymore. Her sleeping at night has gone pretty well too. She sleeps about six hours or so before waking us up to go out. In fact, sometimes Hailey is the first one to wake up and we're like "Shhh...or you'll wake up Sadie!" It's nice you know, having our Berners as the bookends to our family. Adler came first before our kids and Sadie nicely fits in as the baby of our family.